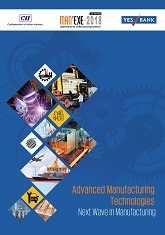 This report, prepared by CII and Yes Bank, provides a snapshot on the Advanced Manufacturing Technologies (AMT), which hold the potential to support Telengana's manufacturing industries across its various focus sub-sectors including automobiles, aerospace, defense and life-science. These AMTs include - 3D printing, Advanced Materials, Internet-of-Things, advanced Analytics, Advanced Robotics, AR and VR technologies. This report also refers to some of the challenges faced by the industry while aligning itself with these AMTs and mentions a few possible interventions to address these challenges. The report was unveiled at the 14th edition Man'Exe-2018 held on on 23 November 2018 at Hyderabad.